Photo Gallery 2014 - DEVON YURTS Glamping in Style! 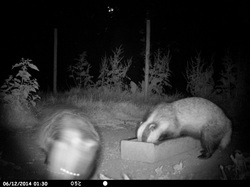 The yurt camp is home to some diverse wildlife including a healthy population of badgers. Check out the dedicated Badger pages on this website to see more pictures of these lovely creatures. Winter is a quiet time at the yurt camp as our yurts are safely stored away in our barn. This is due to the planning restrictions imposed on us by the local council which means that the yurt camp can only open from 15th March - 15th November every year. This picture (taken on January 19th 2014) showing the moon was particularly spectacular and for all you keen photographers this picture was taken using a Canon EOS 7D 400 iso 500th f5.6 Canon 200mm zoom with polarising filter (handheld). 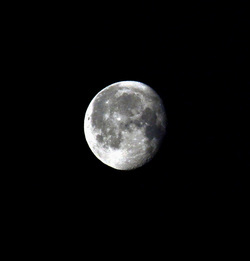 Over the summer months the moon is equally fantastic and one of the things that many of our guests have commented on is the beautiful clear dark skies with no light pollution, ideal for star gazing and also the quietness of the countryside. 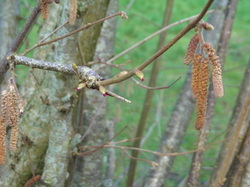 Well 2014 has meant that the whole of the UK has had the wettest January since records began but despite all the rain and storms we have some tiny signs of spring at the yurt camp, the catkins are blooming on the hazel trees in the orchard! We are optimistic that Spring is on its way with drier weather soon we hope! 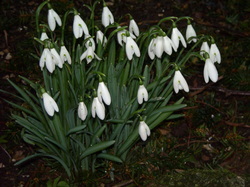 Pictured here are some delicate Snowdrops blooming by the bank of the river Hems.